This organ belonged to Sheila Lawrence, was sold to Ian Pleeth, for whom we restored it, and now belongs to Michael Latcham. Its provenance was unknown and there were no marks inside the organ to indicate a history. It is a curious organ in one respect, its key compass, which suggests its possible commission by a musician. 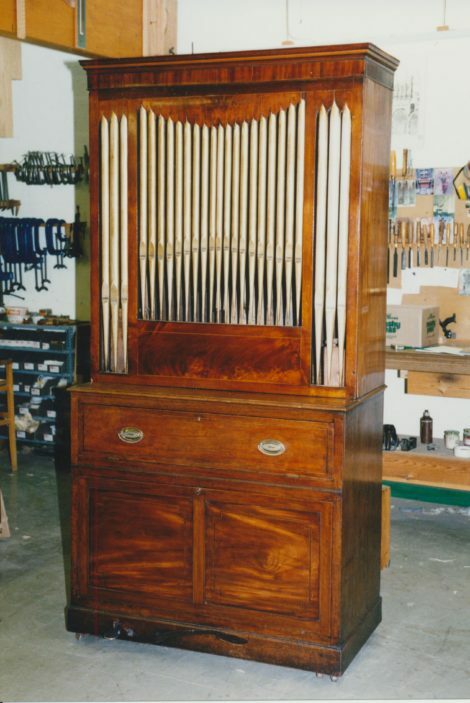 The pipes, their marks, the layout, the keyboard and stops and the simple casework suggest the workshop of John Avery, whose bureau organs are very similar. The keys tilt up into the organ in the same way. The blowing is by foot only, and the wind pressure is provided by springs attached to the bottom of the wind chest, with wheels running on the top leaf of the single-fold horizontal reservoir. Edward Bennett restored the organ. His main work was stripping and restoring the wind chest, which had runnings and ciphers. The casework needed some restoration work, to warped panels and to the surface polish. The key compass is C D to c4. The stops are Stopped Diapason and Principal, divided bass/treble at bº/c¹.